Samson et Dalila, Camille Saint-Saëns’s late Romantic epic, vividly evokes both the sensuality and violence of its biblical source material. With two Met legends as the title lovers, this broadcast from the old Metropolitan Opera House crackles with intensity from beginning to end. 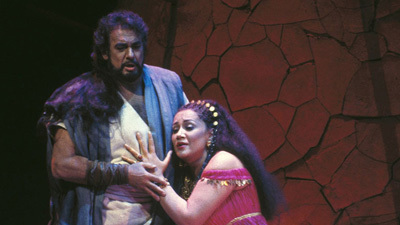 Tenor Ramón Vinay is Samson, the Israelite titan led astray by the seductive power of Risë Stevens’s elegant Dalila. Vinay’s dark timbre and soaring power convey the character’s mythic strength, while Stevens brings sumptuous tone to the determined Dalila. Emil Cooper conducts a cast that also includes American baritone Robert Merrill, as the menacing High Priest, in Saint-Saëns’s kaleidoscopic score.